I am sure that most of us take too many of our blessings for granted. We get used to the comforts and conveniences of life and to the people with whom our lives are intertwined. We compare ourselves with others who seem to have it better than we do, and we forget that all our blessings are God’s good gifts to us. When we do not appreciate them, we become selfish and fall into the idolatry of thinking that satisfying our own immediate desires is the most important thing. Today’s gospel passage is a powerful reminder that those who are most grateful are sometimes those who have the least and who have suffered the most–perhaps because their struggles have helped them see what is really important in life. Today we read that the Lord healed ten people with the dreaded disease of leprosy, but the only one who came back to thank Him for the life-changing miracle was a Samaritan. Samaritans were hated by the Jews as religious and ethnic half-breeds who had mixed the worship of the true God with paganism. 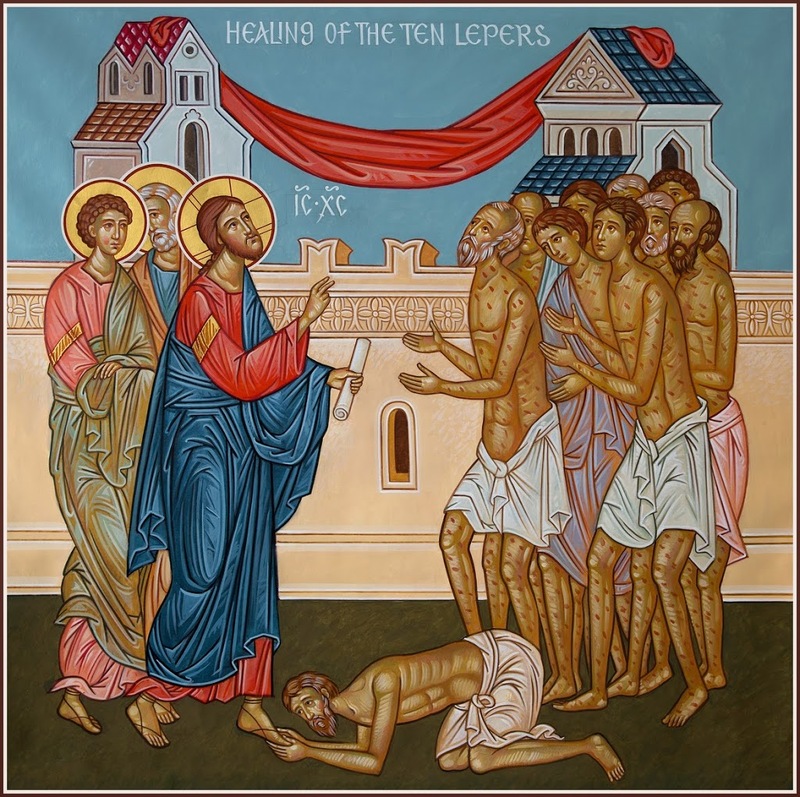 Since lepers were also outcasts and considered so unclean that no one could get anywhere near them, this Samaritan leper surely had nothing going for him in that time and place. But he alone returned to Christ to thank Him for this miracle and to give glory to God. This man’s healing is a sign, a glimpse, of the fulfillment of the good news that we celebrated at Christmas and Epiphany and that is at the very heart of our faith. The healing of the Samaritan leper from a terrible disease is an icon, an image, of our salvation, of our fulfillment and transformation in the God-Man Jesus Christ. And of course, this great blessing extends to all who have put on the New Man in baptism, regardless of their nation, race, health, or standing in any society. As the healing of the Samaritan leper shows, God’s mercy extends to everyone who truly responds to Jesus Christ with faith, repentance, and gratitude—no matter how miserable, wretched, or sickened we have become due to our own sins, those of others, or any other circumstances in life. But in order to receive Christ’s healing of all the effects of sin and death in our lives, we have to put to death the diseases of soul that have taken root in us. These are the ways of the old man, the ways of corruption that lead only to despair. They are a spiritual leprosy that distorts and disfigures us and those with whom we come in contact, and—if not healed—will make it impossible for us to participate in the blessed eternal life of the Lord. The leper in the gospel is a model for all of us who struggle to embrace Christ’s healing, for all of us who wrestle with the ways of the old man. The Samaritan joined with the other lepers in calling out, “Jesus, Master, have mercy on us!” In other words, he began with humility, openly acknowledging that he was sick, needed to be healed, and could not work his own cure. He did try to fool himself into thinking that he was well and did not need healing because of what he could accomplish by his own power. We should do the same thing in our prayers every day of our lives, confessing our sins and asking for the Lord’s forgiveness. We should also acknowledge our weaknesses daily and pray for strength to resist temptation, to calm our passions, and to help us grow in holiness. The struggle to live faithfully can certainly be frustrating at times, especially when we are aware that our sins isolate us from one another and even from our selves. The burdens of guilt and shame can literally separate us from others and make us feel as unclean and helpless as a Samaritan leper. That is one of the reasons why the sacrament of Confession is such a blessing, such a source of strength in our journey to the new life in Christ. In Confession we are reminded that we are not left alone to struggle with our sins, for the priest is an icon of the Lord, conveying His mercy and providing guidance for the healing of our souls. If we want to be healed like the Samaritan leper who called out for mercy and then returned to give thanks, we will come to Confession regularly, naming our sins, especially those of which we are most ashamed and which threaten to destroy our relationships with the Lord and our neighbors. We will kneel before Christ in humility, bare our souls, and be assured of His forgiveness, if we are truly honest and repentant. Confession is a therapy for our healing, and a reminder that we are members of a Body united together in love and mercy. Christ says to each of us in Confession through the voice of a priest, “Arise, go your way. Your faith has made you well.” All who want to hear those blessed words from the Lord should come to Confession on a regular basis, and especially when they are aware of a grave sin in their lives. The Samaritan is also an example for us in his obedience because he did what Christ told him to do, to head toward Jerusalem to show himself to the priests. And as he was going, he was healed. Here we have another powerful image of the Christian life, for we open our lives to the Lord’s healing by obeying Him, by actually keeping His commandments. A drug dealer will not find honest work by continuing to sell heroin. An alcoholic does not become sober by continuing to drink. No one will experience victory over any sin in their lives if they simply give into it or make up excuses to justify their actions. In other words, we all have to repent, to turn our lives around toward God in specific, practical ways. We may fall flat on our faces a thousand times, but we must at least be inching along in the right direction. The Samaritan was going toward Jerusalem in obedience to Christ’s command and we also must be on the path to a holier life through obedience, doing what we know we must do in order to live as those who have put on the New Man Jesus Christ in baptism. The reality is that we cannot expect to find healing for the corruptions of our souls if we do not obey the Lord. If we do not pray at home and at church, practice fasting or other forms of self-denial, give to those in need, forgive those who have offended us, and keep a close watch on our thoughts and actions as we struggle mightily against our besetting sins, we put major roadblocks along our path to the healing of our souls. No matter what we do, we will not heal ourselves any more than the leper did, but we must put ourselves in the place where we may receive the mercy of Christ. That is always the place of humble obedience to His commandments. Finally, we learn from the Samaritan leper to be grateful for every step of progress, for every bit of strength we gain. It was not simply walking toward Jerusalem that healed this man; it was the mercy of Christ. The leper certainly knew that, which is why he returned to the Lord to thank Him. And what thanks should we offer God for our blessings, for life itself, for the promise of forgiveness, and the hope of salvation? We give thanks by offering every aspect of our lives to Him and thus become epiphanies of His salvation in every word, thought, and deed. For He is the Alpha and Omega Who created all reality out of nothing and on Whom our life is entirely dependent. We have nothing and are nothing apart from His mercy, love, and grace. Nothing fits in its proper place in our lives until it is offered to Him for blessing and fulfillment. But everything is healed when—through humble repentance, obedience, and faith—we turn from the dark night of sin and toward the brilliant light of holiness. So just as we offer bread and wine in the Liturgy, let us offer thanks to the Lord by living lives that are pleasing to Him, by living according to the New Man Jesus Christ, and killing the habits of death and darkness that can so easily destroy us and harm others. For Christ was born and baptized in order to heal us and to bring us into the new life of His Kingdom. He made a wretched Samaritan leper an icon of His salvation and He will do the same with us, despite our weakness and corruption, if we follow that man’s example of humility, obedience, and gratitude. At the end of the day, that is a powerful reminder to take absolutely nothing in this life for granted and always to give thanks.